Peebles were the club who ended runaway leaders Biggar’s unbeaten run on their own ground back in October. But the Lanarkshire club ironically gained revenge on Saturday by coming to The Gytes and scoring a win which finally clinched the National League Two championship. Playing in near-perfect spring-like conditions, both sides played an expansive, hard-tackling game, which entertained the crowd. Biggar drew first blood when, after 20 minutes, Matthew Stewart kicked a penalty to put them 3-0 up. As expected, at this stage, Peebles had the edge in the tight, with their pack disrupting the Biggar eight in the scrum. The home lineout, however, didn’t function just as well, with ball won but not as tidily as would have been preferred. Biggar lost prop Donald Voas through injury – his brother Douglas was in the Peebles squad – and replacement Paul Davidson helped Biggar take at least three put-ins against the head – an unusual occurrence for Peebles. Some good lines were taken by both sets of backs, while kicks and chases provided real excitement. 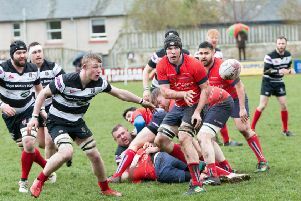 The next score came from Biggar captain Alan Warnock – a former Peebles player – who got on the end of a great attack to score a try which Matthew Stewart was just unable to convert. The opening exchanges for the second period saw Biggar scrum half Davy Reive shown a yellow for preventing fair release. Peebles tried very hard but could not capitalise on the one-man advantage, with the visitors uncompromising in defence. The game was won on the back of two Peebles attacks which misfired – this as much to do with Biggar pressure as any perceived Peebles errors. The first saw Ross Bradford snaffle an interception pass from Peebles stand-off Donald Anderson to run home from half way. Another Anderson pass shortly afterwards fell in similar fashion to Gregor Stewart, who also ran in from long range. Matthew Stewart (unrelated) kicked the conversions to both these scores to put Biggar ahead and effectively out of sight. It looked as if Biggar would keep a clean sheet – which in itself would have been cause for celebration – but Peebles winger Scott Stoddart made amends when, and with only seconds remaining, he latched on to a speculative pass from Conor Lavery to beat the Biggar chase for a try. A stramash ensued as Biggar’s replacement winger, Iain Renwick, slid into Stoddart as he scored, while the conversion, by Anderson, was successful. A whistle by referee Gardner signalled a penalty restart to Peebles on halfway – not celebration time, as Biggar had thought. But the festivities weren’t deferred for long, with a mistake bringing to an end a series of phases begun by Peebles.